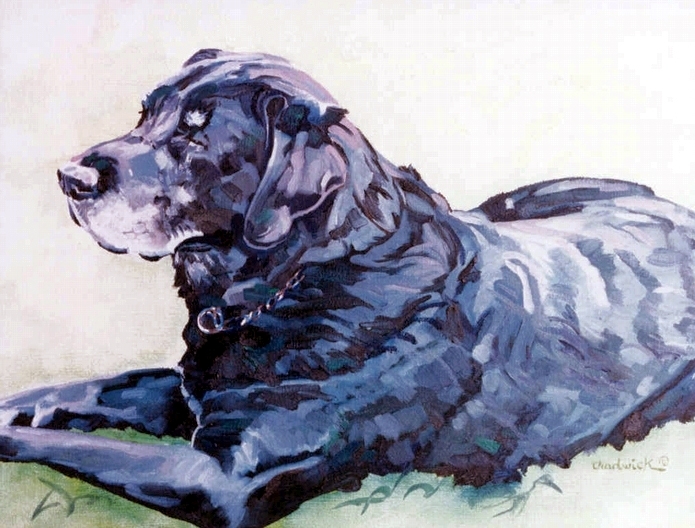 Phil Chadwick's Art: #0355 "Clay"
"Clay" is one of those big, goofy and friendly dogs. He pees on at least one if not all four tires of your car every time you park in the drive. My son and I used to visit and take Clay for long walks in the fields and forests along the 12th Concession of King Township. We all enjoyed the walks together and saw lots of nature. That was years before we moved to and restored Watershed Farm. I knew the black Labador well and the paint just flowed with personality. Clay had a great character and was a good dog! A good dog makes you want to be a better person too. Clay passed on soon after this and we got our Chesapeake within a year when we moved to the farm on the very crest of the Oak Ridges Moraine.